Nutrients need to be in plant usable form and be in the root zone when needed. Synthetic chemical nutrients are quickly available for plants, but they tend to leach away quickly with watering. Organic nutrients stay in the root zone longer, but often take time to break down to plant available form. Help both forms of nutrients be best used by encouraging soil microbe populations, ensuring sufficient carbon for an adequate carbon to nitrogen ratio, and adding humic acids to cause a beneficial cation exchange capacity (CEC) to help hold nutrients in the root zone. Minor nutrients and trace minerals in the soil are often depleted and never replenished. For optimal performance, plants need more than just nitrogen, phosphorous and potassium (N-P-K). Scientists have identified 10 other elements needed in lesser amounts (sometimes trace amounts) for plant growth. Likewise the soil food web needs trace elements and minerals to thrive. Popular fertilizers almost never provide any of the secondary and minor nutrients and trace minerals. Add other materials such as kelp and trace mineral packages to broaden the base of available nutrients in the root zone. 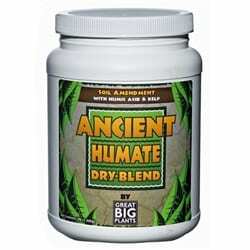 Compost extract supplies humic acid, kelp, trace minerals and selected microbes. 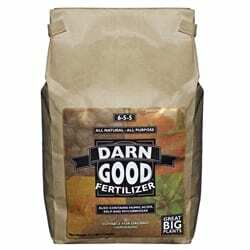 All purpose fertilizer supplies 6 essential nutrients, plus humic acid, kelp, and endo mycorrhizae. Use appropriate soil that is well drained and rich in organic matter. 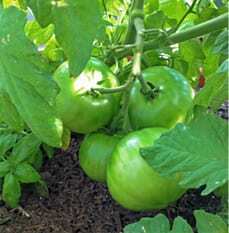 Locate tomato plants in a proper microclimate; sunny and 55⁰-85⁰ F as much as possible for best fruit set. Plan for proper timing of planting to be growing during the right temperature range. 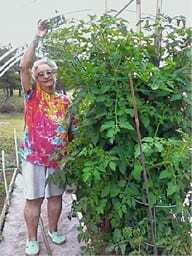 Choose appropriate tomato plant varieties for your area. 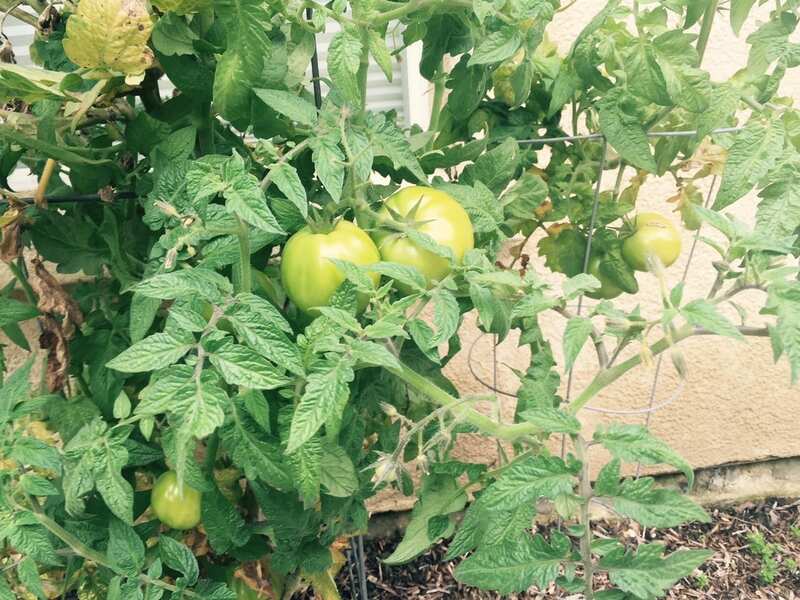 Your tomato plants require a minimum of 6 to 7 hours of direct sunlight for proper growth. More direct sunlight = healthier plants; 10 hours is optimum. 12 is awesome. They also need rich deep fluffy well-nourished soil for garden health, and for the best possible flavor in your homegrown tomatoes. The finest tasting tomatoes come from plants grown in rich, healthy well-amended soil. The taste of a tomato, (or any crop) grown in poor soil can be flat and bland compared to the big grand tomatoey taste of the same variety grown right next door in well-tended soil, teeming with biological activity. Organic soil amendments are the key. Add compost every year. Before planting outside, please wait until night temperatures are reliably above 55º for a couple of weeks. It takes that long for the soil to warm up. The soil must be warm when you plant! Tomatoes are a hot weather crop, not a sort-of-starting-to-warm-up-weather crop. If your plants have buds or blossoms on them when they arrive, and you have a long growing season, snip or pinch off any buds and blossoms. Leaving flowers on the plants at this early stage can take some of the growing power away from the root system. Remove buds and flowers for about 7-10 days after planting out. (Skip this step if you have a very short growing season.) If you leave flowers on the plant now, you may get a weaker plant and a smaller harvest during the season. Before planting, remove some bottom foliage, about half of it, pinching or snipping off the lower foliage (it should look like a palm tree) you will be placing the plant deeply into the ground so that only this top foliage is above the soil line and the stem from which you removed foliage will be buried. Those little hairs along the length of that buried stem will become nice strong feeder roots will grow all along the length of that buried stem, giving you a much healthier plant and a far more abundant harvest. Mulching is important, inexpensive and easy. Lay down a loose layer, 4″ – 5″, of straw, hay, dried leaves or dried pine needles over the soil beneath your plants. The mulch will keep the soil moist, the soil temperature even, and prevent splash-up when you water, thus keeping the foliage dry and controlling fungal disease. Be sure to stir the mulch around once a week or so to prevent fungus growth in moist tightly-packed mulch. In very hot climates, use 6″ – 7″ of mulch. Cover the entire bed except for the area nearest the main stem, leave bare a 3″ – 4″ diameter area at the base of the main stem to keep the stem dry. Your mulch will also break down over the season and nourish your soil. You will feed your plants the day you plant, and again every 3 weeks. 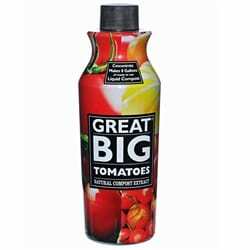 Just give them a light feeding of Great Big Tomatoes, liquid fish and kelp, (follow package directions) and a dose of organic fertilizer; about 2 to 3 tablespoons scratched into the soil surface at the base of the plant and watered in gradually when you water. Remember that excess feeding will cause excess foliage growth and very few tomatoes as it stresses the plant and can cause disease. Important: feeding with “the blue stuff” will cause excessive foliage growth and no fruit set and does nothing to nourish the soil. Always try to use something natural. I believe the only thing blue in your garden besides flowers ought to be your jeans.